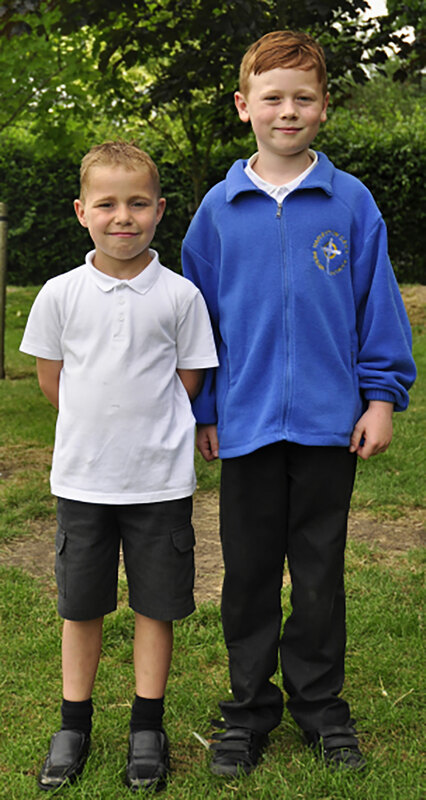 All pupils are expected to wear school colours. Royal blue sweatshirt, royal blue fleece or royal blue cardigan. Black or grey trousers or black or grey skirt or pinafore dress. Sensible, flat, plain shoes in black, brown or dark grey, with no platform soles or heels over 4 cm, should be worn. In summer, sensible sandals with a back strap (not mules) can be worn. Hair colour should be natural. For safety reasons, long hair should be tied back/held by simple bands, clips or slides. Summer uniform includes royal blue check school summer dresses or tailored black or grey shorts. We require all children to change for PE and Games. Items for PE are light blue polo shirt and black shorts. PE kits should be kept in school throughout the week. Plimsolls are required for indoor and playground PE, trainers or football boots and a black tracksuit/jogging bottoms/sweatshirt (not leggings) are needed for Games in the winter months. All clothing must be labelled. In order to follow safety regulations, the only jewellery allowed is one pair of smooth, flat ear studs with no rear projection. Pupils may wear watches but the school accepts no responsibility for loss or damage and they should be clearly marked with the owner’s name. All jewellery and watches, including earrings, must be removed for P.E. and swimming lessons to prevent injury to the wearer or to others. An old shirt or apron is necessary for art and craft activities. To arrange a visit to the school, or if you require paper copies of information on this website, please contact the school office.